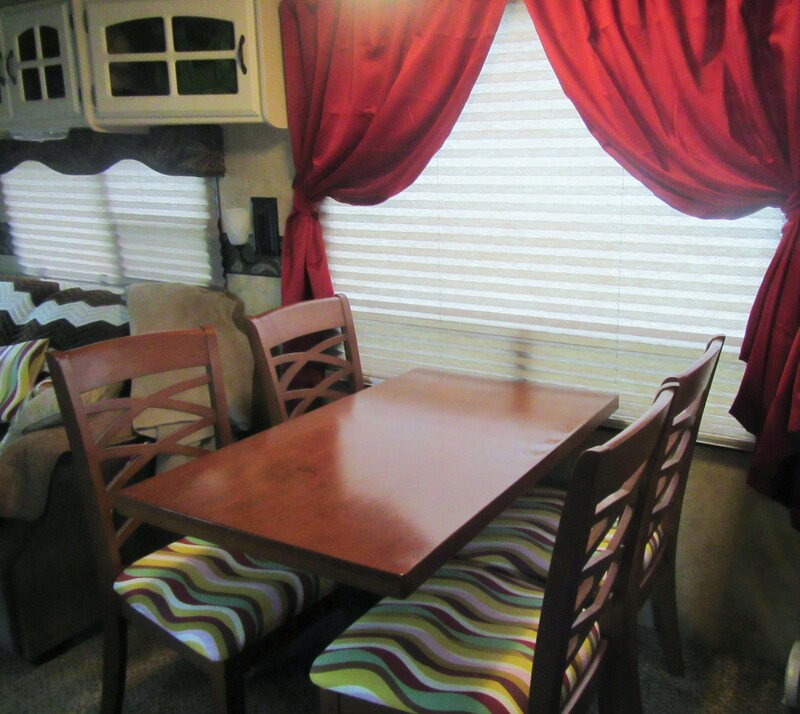 A few days ago, I posted Beginning to Make It “Ours.” It discussed how Jim and I are changing the décor of the RV from what came from the factory to something that suits our own personal tastes a bit more. 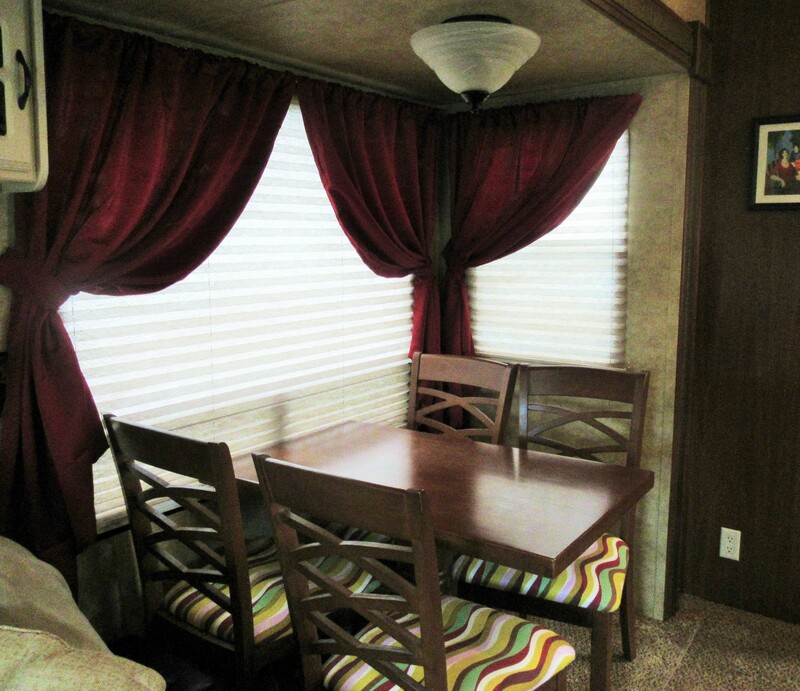 Everything in the RV ran the color range from cream to dark brown, and there was nothing from any other color family. After spending a winter in the drab surroundings, it was time for a change. We began in our bedroom, and you can see what we did there by going here. Today, we have completed part two of the color re-do in our 5th Wheel. This part was done in two parts. First, we re-covered the cushions of the dining room chairs. Next, Jim had to remove the valances (Sydney must have been ready for a change as she gave us a help with one of the valances on our move up through Mississippi.) Since the shades were attached to the top of the valances, Jim had to re-attach them to the walls. After putting up curtain rods, I was able to hang curtains and make tie-backs to use with them. Those were put up today. Below are pictures of the changes. 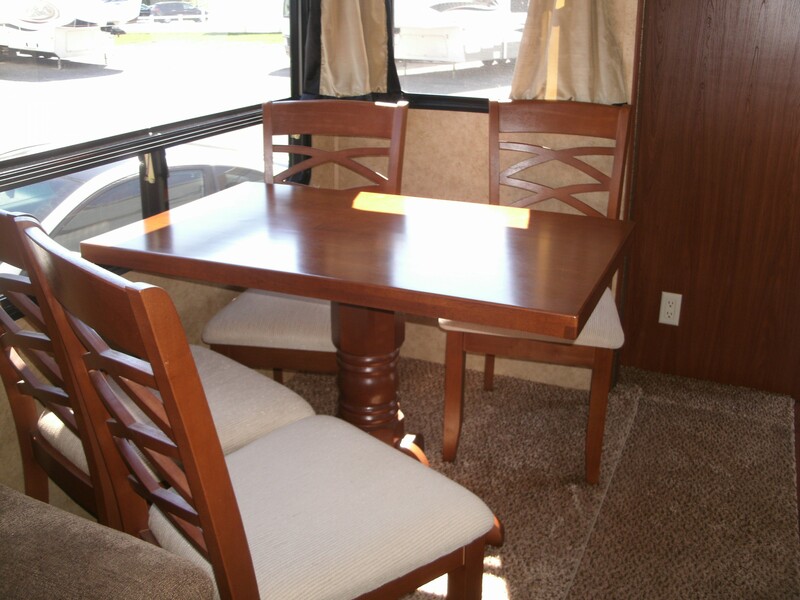 First, this is the dining room table and chairs as they were when we bought the camper. There is nothing wrong with this except that the entire RV had only colors in the brown family, and we needed some spice in our life. This is how the chairs looked after re-covering the cushions. While we had already removed the beige curtain panels that velcroed into the valances, we had not yet removed the valances (note: I now know the correct term is cornices, not valances.) themselves or straightened out the issues with the shades. This is the final product for the dining room and kitchen area (there is a small red valance over the top of the blinds next to the sink). Unfortunately, the finished product looks dull due to lack of good light today.. No matter how I tried, I could not get enough good, natural light to show the true colors as it is a cloudy, rainy day today. The weather forecast indicates it is going to be like this all week, so if/when I get a better shot, I’ll post the picture here later. I will say that all of the curtains we are putting up, though lightweight and bright (despite appearances in this last photo), are room darkening and thermal. 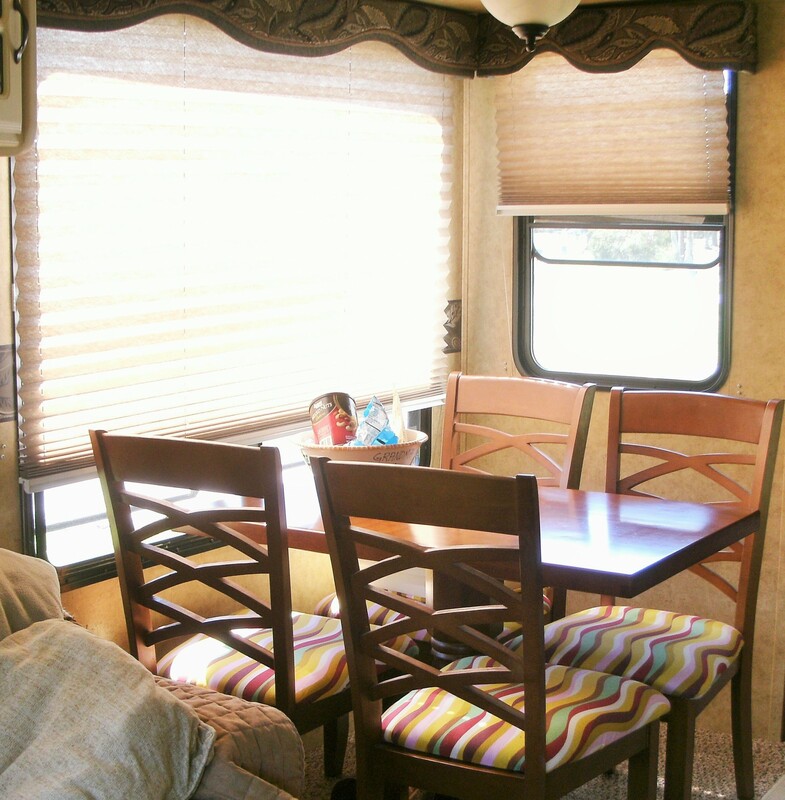 By closing the curtains, on really cold or really hot days, we will save energy, taking less propane to heat and less electricity to cool the camper. Since we didn’t have the day/night shades, with the shades down and the curtains drawn, the windows now provide complete privacy and shut out most of the lights from other sources that would hinder my ability to sleep. We’re very happy with the changes, but it will be a couple of months before we find out how well they travel. Next will be the living and entertainment area; you can see the heavy, brown valances are still up over the sofa.